The Marine Mammal Center hosted the Grand Opening of their exciting new exhibit featuring work by Oregon artist Angela Haseltine Pozzi. 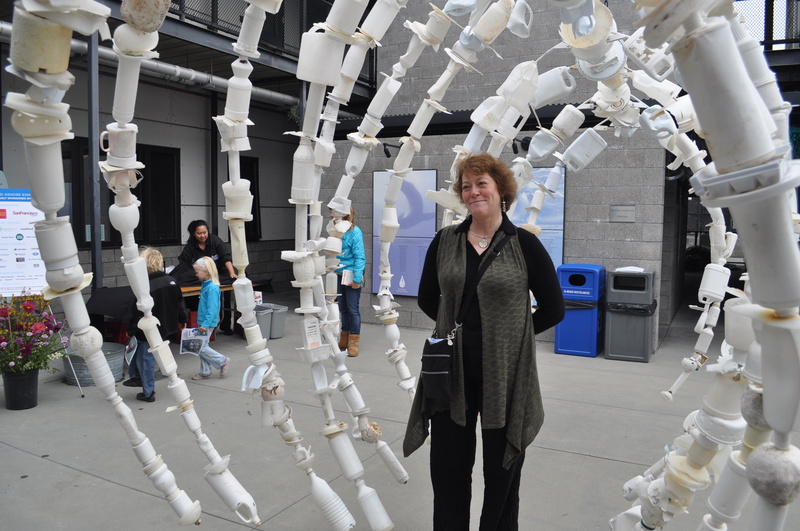 Along with her team of community volunteers, she collected approximately 7,000 pounds of trash from 20 miles of beaches along the southern Oregon coast last year and fashioned it into sculptures, all related to the sea: fish, turtles, jellyfish, coral and more. Folks at the Marine Mammal Center in Sausalito, California know better than anyone about the catastrophic effects of marine debris on sea life. Every year, they are faced with attempting rescues on animals who are entangled in nets or have ingested plastic waste, often with lethal effects. And it gets worse. When plastic degrades and breaks down into powder-sized bits, even plankton will ingest it, causing plastic to be almost omnipresent in the marine food chain. In every square mile of ocean, there are 46,000 bits of plastic. Bits and pieces of plastic caps, bottles, netting, flip flops, bottles and other trash — mostly plastic — were organized by color and then assembled into large sculptures. The show can be viewed any day through Oct. 15. It is free to the public. This is the first time the art has been in California. When it was displayed in Oregon last year, Jeff Boehm, executive director at the Marine Mammal Center, saw it and wanted to bring it to Marin.